It's time for Papercraft Star challenge #6 . Post a card at Papercraft Star and you may be this week's winner. Good luck and thanks for stopping by. I've been checking all the sites for the new CHA releases and I'm amazed at what I'm finding. I love everything, but this new Mix and Mend line really caught my eye. You have to check it out. The challenge at Justrite Stampers this week is to create a photo card. This was definitely a challenge and I wasn't quite sure what I would do. I experimented with a lot of ideas and finally came up with this one. I used Spellbinders Nestabilities Labels 12 and the Oval Large. 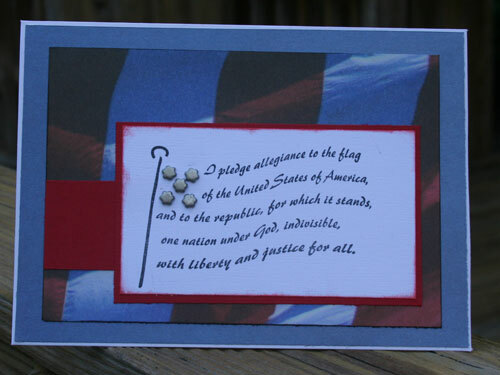 I first started by creating a card, but not cutting the top edge with the die. This created the fold at the top. 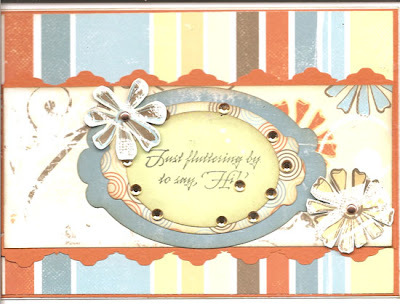 I then punched another piece completely and layered that atop the card after I embossed it for a nice bumpy effect. I then inked around the edges. 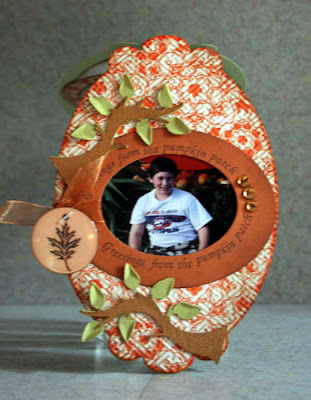 I added a photo of my son in the pumpkin patch because my Justrite Stamps were a perfect fit. Some Copics to color in the pumpkins and I was done. I added a little matching bling for effect and some branches cut from my Cricut and a button over some ribbon. Check out this amazing blog candy here . Gini has put together a ton of stuff to celebrate her blog-aversary. Congrats Gini. Good morning everyone. 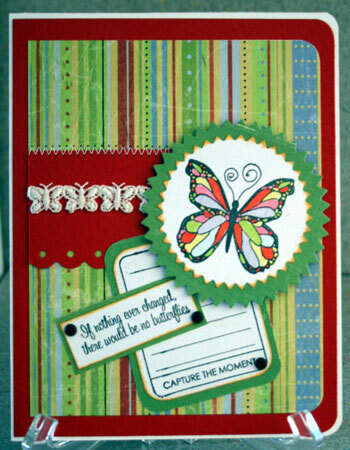 I posted this card on the Just Imagine blog using the wonderful butterfly punch (#901). Love it!!!! 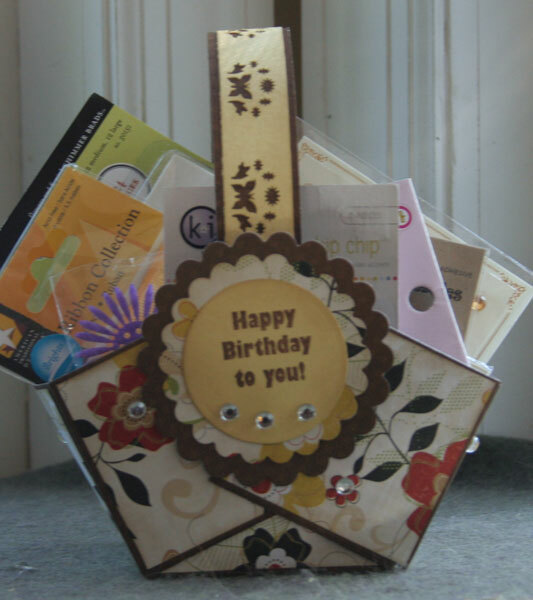 I picked up some inexpensive different shaped cards recently figuring I'd be able to create with them. Well, they turned out to be perfect for my butterfly punch. I simply pulled out a strip of cardstock from my stash and punched away. I stitched another piece on top and added my sentiment. I then punched some flowers from Tim Holtz's new Sizzix die and a perfect card was done in no time at all. So, Sweet Craf-tea Chick, please send me at email at stephanie_ackerman at hotmail.com so I can get your goodies out to you. 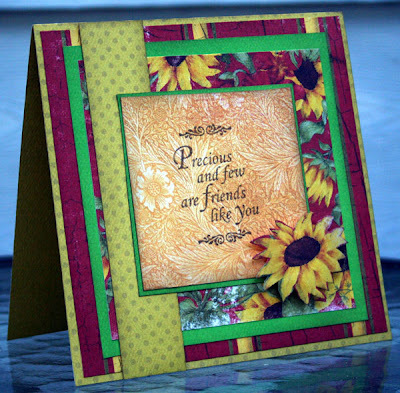 Welcome to the first ever Papercraft Star Blog Hop. I hope that you are enjoying everyone's "Christmas in July" projects. If you have arrived here from Suzy's blog , you are in the right place. If not, you'll want to start at the HERE . You certainly don't want to miss any of these projects. Each member has some wonderful blog candy to give away, so be sure to visit every stop along the way for your chance to win. All you need to do here to win my blog candy is to leave me a comment and become a follower of my blog. If you chose to create a new Christmas card, you'll have an extra chance to win the blog candy which consists of 12 different Studio G stamp sets. I'll annouce the winner on July 26th, so be sure to come back and see who wins. The next stop on the hop is Catherine's blog . Thanks for stopping by and enjoy the hop!!!! EDITED: THe follow button is at the bottom of the first page. On Tuesday, Bo Bunny posted a new sketch on their blog. I love sketches. I find that sketches are a wonderful way to help you get creative when you aren't feeling very creative. It's also a wonderful way to get you thinking about using products you have accumulated but not used. I absolutely love Bo Bunny products, but I do tend to hoard them and look at them!!!! So this sketch was the perfect start I needed to use my wonderful collection of products. The base of my card is the Honey Mustard Dot paper. I have had the Tuscany Garden collection for quite awhile, waiting for just the right inspiration. Well, this was the perfect sketch for this paper line. My Justrite Stamps were just the perfect sentiment. I cut out one of the flowers, added pop dots, and created an embellishment in the corner. YourNextStamp is looking for new DT members. 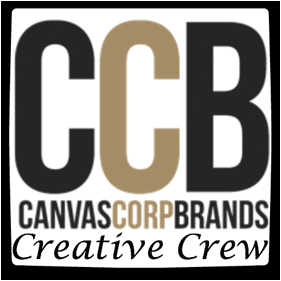 If you haven't check out their site you should. Their stamps are absolutely adorable and sweet and the current DT members have created some really wonderful projects. I'm submitting these cards in the hopes of getting a coveted spot on their new design team. Join us on July 23-25 as we host a Papercraft Star Blog Hop. 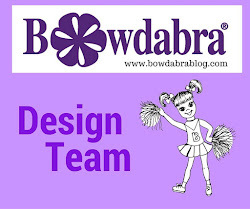 You will travel through each of the design team blogs for a Christmas in July blog hop. Blog candy will be available, so don't forget to stop by. 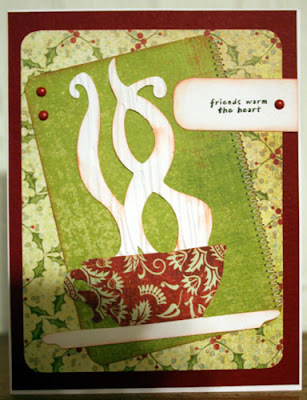 The challenge at Justrite Stampers this week (#027) is to create a Christmas card. Well, Christmas just would not be quite right without lots of snow, so I chose to use the Let It Snow sentiment from the 1 5/8 Designer Centers and Borders set to create my card. 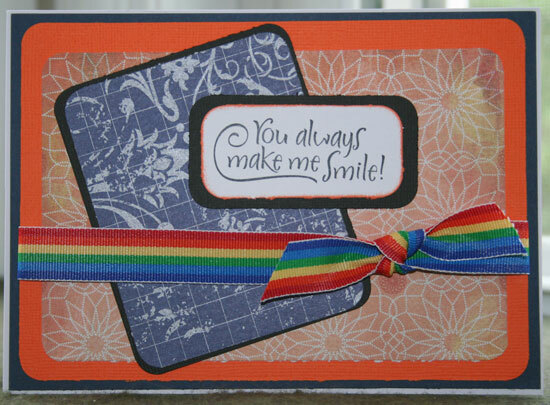 I stamped the sentiment on the cardstock in black ink to create my background. Then I ran it through my Cuttlebug Snowflakes embossing folder. 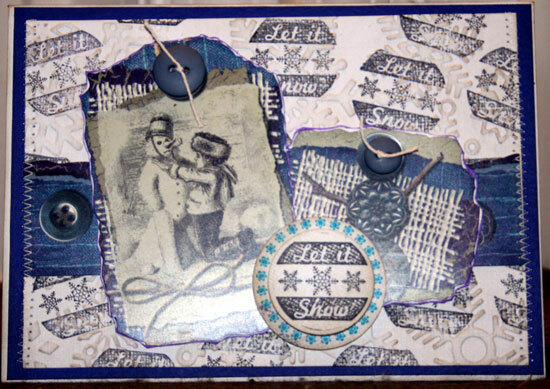 For a vintage look, I inked the background with Walnut ink before adhering the stickers and another Let It Snow sentiment on top. Good morning everyone. My project this week utilizes a basket you can easily recreate here . I chose to use the Butterfly punch (one of my favorites) on the handle. 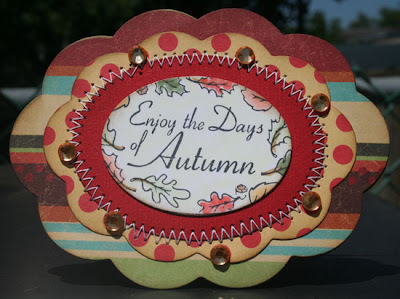 Don't forget to check out Just Imagine Crafts blog for more fun ideas on using their punches. My newest layout is now posted at Scrappin' Sports Stuff . 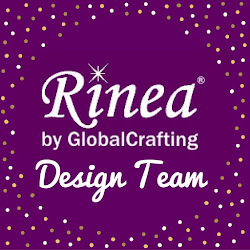 I so love the variety of products I can select for each project I want to create. This week at Papercraft Star we based our project on our favorite sports team. Who are they? How would they inspire you? What are the team colors? Who is the mascot? What is the name? Here in New York we have a number of teams. Since my son's favorite sport is ice hockey, how could I not base my card on the New York Islanders? The home jerseys are blue and orange and those are the colors I selected. I have always loved punches. They can add such a great look to any number of projects you create. For this card, I used punch #916 choosing to let only the scalloped sections show, This created a nice border for my framed sentiment. Once I had one side done, I flipped it over to line up the scallops on the other side. Very quick and easy to do. 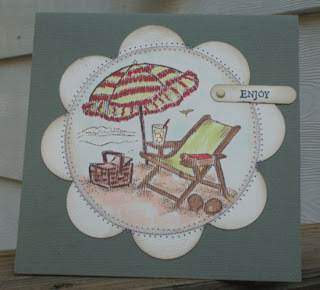 The challenge at Justrite Stampers this week is to create a mini card. Minis can be really fun to make when you want something different, or need a card in a hurry, so I really enjoyed the challenge this week. I used Spellbinders Nestabilities Scalloped Oval Large and Oval small to create this card. 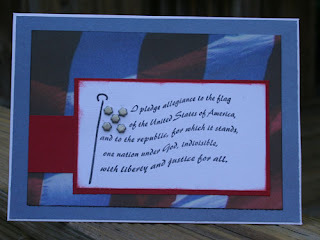 I first started by creating a card, but not cutting the top edge with the die. This created the fold at the top. I then punched another piece completely and layered that atop the card so I could build my card on that. Using my Justrite Stamps and some Copics and a lovely fall card was made in no time at all. Adding a little matching bling didn't hurt either!!!! My newest project is posted at Scrappin' Sports Stuff . 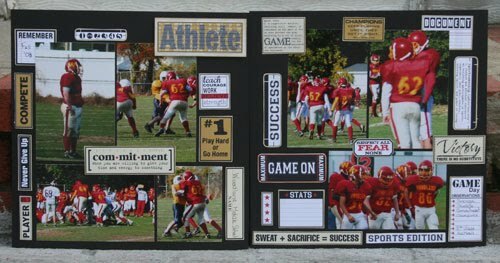 I absolutely love this line of sports paper by Teresa Collins and did not want to cut it up so I chose to cut it apart and use specific words to help set the tone of my layout. I love the Teresa Collins Sports Edition papers, but just couldn’t bear the thought of covering it up with my photos. So for my football layout I decided to create a two page layout by cutting apart the words and using them to set the tone of my layout. Use black cardstock for base of layout. Cut apart Teresa Collins – Sports Edition – Game On Paper, then lightly ink the edges using Tim Holtz Distress Ink Pad – Vintage Photo. Select “Athlete” as the title and mat it on white cardstock and lightly ink the edges using Tim Holtz Distress Ink Pad – Vintage Photo. Start by placing the photos and the cut outs on the base and rearranging until you like the look you’ve created. Adhere the photos first, then adhere the cut outs. Don’t be afraid to overlap and underlap some of the cut outs. Use “Game Day Observations” as your journaling block. 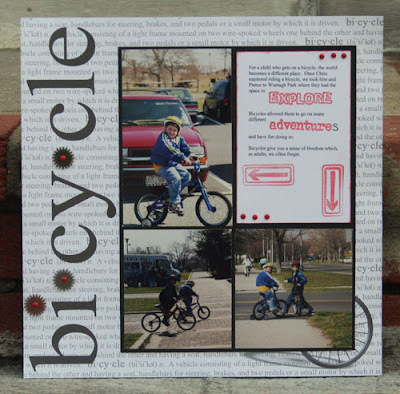 Create a journal block and position additional cut outs to fill in space. Add ANM – Mini Pop Dots to the title so it stands out on the layout. 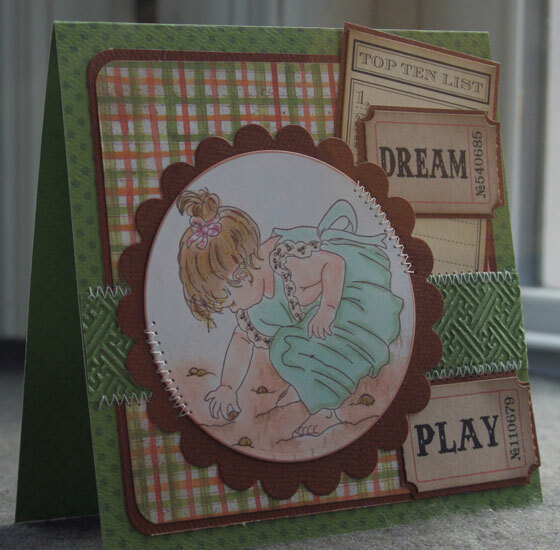 The challenge at Justrite Stampers this week is to create a card with a completed inside. I used Autumn Blessings Borders and Centers for the front of my card and Thinking of You Borders and Centers for the inside. (Please forgive the poor photo, my computer had to go in for repairs and this was the best I could get!) Using Nestabilities Large Oval set, I cut the stamped image after I colored it with Copic markers. 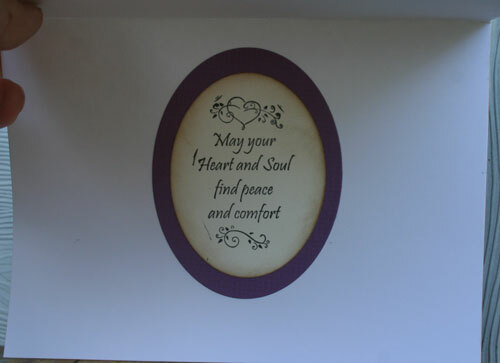 I then matted the image to purple cardstock and again onto white cardstock which had been cut with Nestabilities Labels 10. I then machine stitched this to the front of my card. 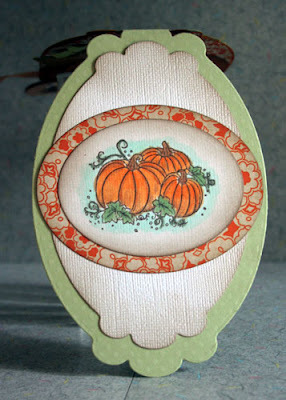 Using the Large Oval set again, I cut the sentiment for the inside. 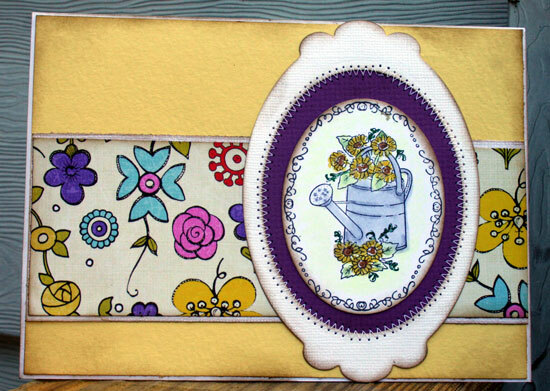 I truly have been enjoying the punches I received from Just Imagine Crafts. The number of projects you can make with them is astounding. One item I received in addition to the punches was a Kreaxion's Circle Cutter. Now, I know what you are going to say - another circle cutter!!!!! Well, that's what I thought when I first received it. I mean there are tons on the market and none works really well. But I have to say that this circle cutter rocks! It is so easy to use and has a very small learning curve. It's amazing. Check out this card I created using just the circle cutter. I cut the large circle at 4" after I stamped and colored my image. I then cut a bunch of 1 1/2" circles to go around the larger circle. 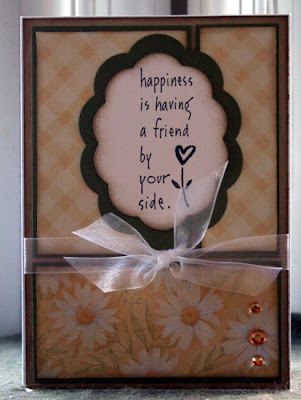 Then I sewed them together to my card. Now head on over to Just Imagine's blog and see what else I've been up to. I'll post a tutorial shortly about those cards too. Don't forget to pop on over to the Papercraft Star blog because this is week 2 of the challenges. We'd love to see what you create with this week's challenge of red, white and blue. 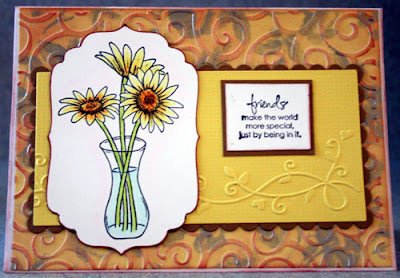 I just won this stamp from DRS Designs and it was perfect to use with this challenge.